If you read Bunny Mad Magazine you may have noticed I’ve been writing a regular article with an enrichment idea (and some behaviour tips). Here’s one I’ve shared plus some extra photos – I think this is one many bunnies will be rather pleased with. Rabbit’s love willow toys, but they can be quite expensive particularly when they are often chewed and shredded in no time at all. So I had a little experiment to see how easy it would be to make my own willow rings, and the answer is very. For this activity you’ll need some willow and some secateurs (or tough scissors – bunny nail clippers might work at a pinch). 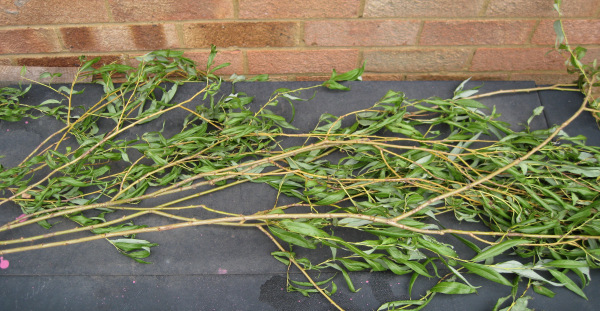 You can buy dry willow for weaving – the stuff that’s used in basket making. This will work fine for toys, but you’ll need to do a little more preparation as it needs soaking first to make it flexible again. The place you buy it from should be able to give you tips on how to do this – time for soaking varies between willow types (from what I’ve read). The trouble with buying willow is you’ll still be paying for willow toys, although it will probably work out cheaper. You may have noticed my preference is for bunny toys that are free. So instead I recommend finding a willow tree and cutting some fresh branches yourself. 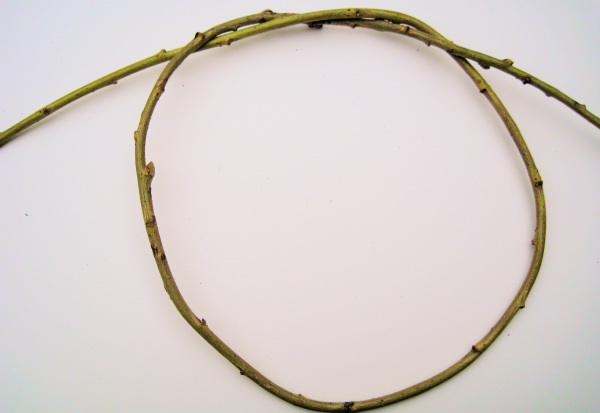 It has long slender leaves and the branches are yellowish brown and bendy – they’ll fold in half without snapping. 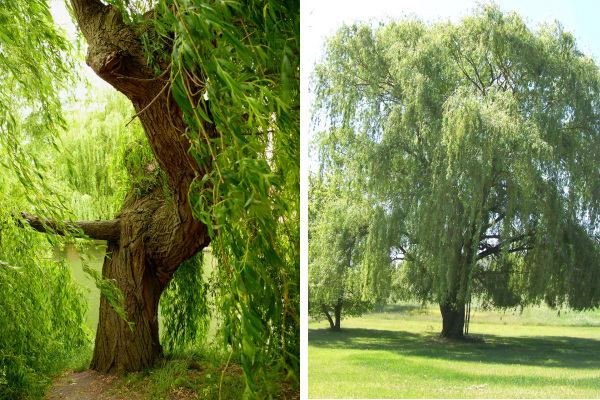 You get weeping willows (pictured), whose branches hang down as well as ones that look like normal trees. Do check the rules on foraging where you live – if you aren’t allowed in public spaces try asking around to see if anyone has one in their garden they are pruning. Now you need to do a little processing to get it ready for weaving. If you’re cutting willow whilst it has leaves, I’d suggest removing them – at least for your first go. It makes it easier to see what you are doing. If you run your hand down the branch backwards (from tip to where you cut it) the leaves come off easily. You can feed the leaves to your bunny to distract them whilst you continue with your willow weaving. They also dry well for feeding in smaller portions later. This isn’t long straight willow grown for weaving, so it’s got quite a few forks and bendy bits. That’s ok though, we aren’t trying to make a pretty basket. To make it easier to work with, just run down each piece and cut at the forks. For a 6″ (15cm) ring you’ll need pieces about 2.5′ (75cm) long. In other words, long enough to make a full circle and another half (3.14 x the diameter of the ring x 1.5 if you’d like the maths). You can get away with slightly shorter, but it’s always easier to have a little spare to cut off than not enough. For thickness 3-4mm seems to be the maximum to bend easily for a 6″ ring; go a little thinner for a smaller one. As long as you have several pieces roughly the right length and thickness, you can use thinner and shorter pieces to bulk it up. 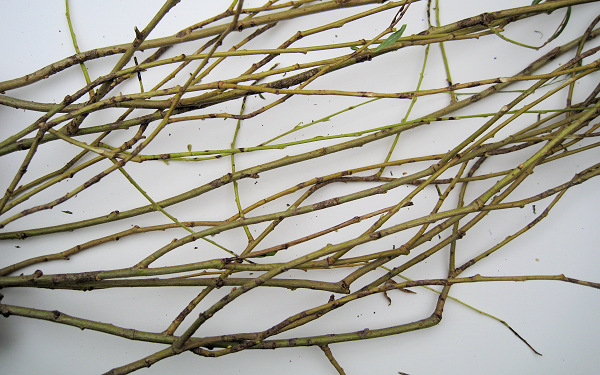 Please don’t worry about getting the perfect length/width willow, I’ve just added the details as a guide, cut some and experiment – it will probably work just fine. We’re ready to move on to the exciting bit – actually making the willow ring. First, pick your favourite piece of willow. A nice even width, longish bit that’s nice and bendy. Then, tie a lose knot in it. That makes your ring. This first circle decides the size of your willow ring, so adjust it to how big you want. Take another piece of willow and tuck it a couple of inches under one side of the ring, from the inside out. That will hold the end in place as you wrap it around the ring, like you did for the ends of the first piece. Again, you can see me adding a new piece here in blue. Keep wrapping it around from there until you get to the end, don’t worry about the last bit sticking out – you can trim it later if you want. 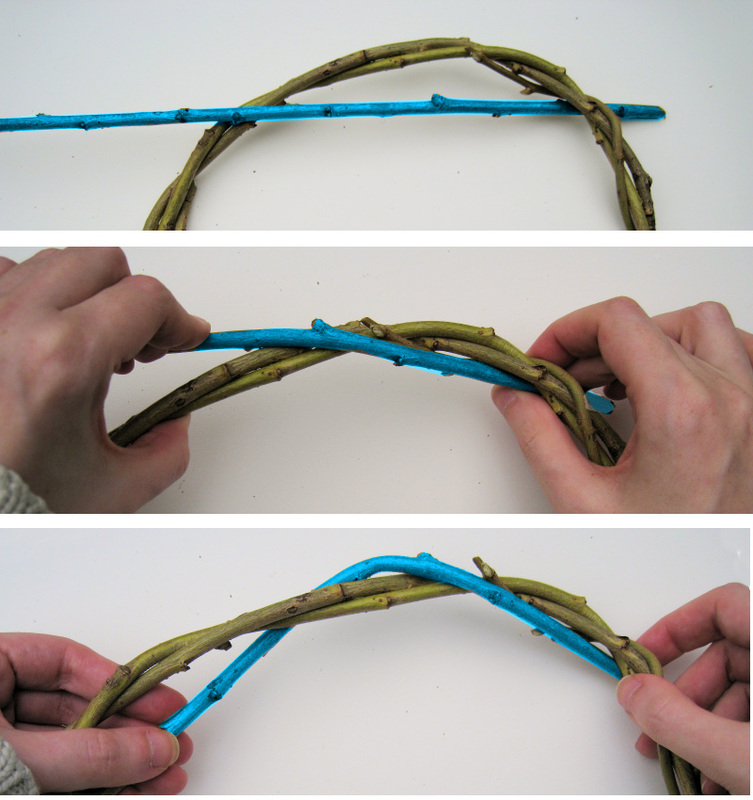 Now you just need to repeat step 5 with more pieces of willow until you are happy with how your ring looks. 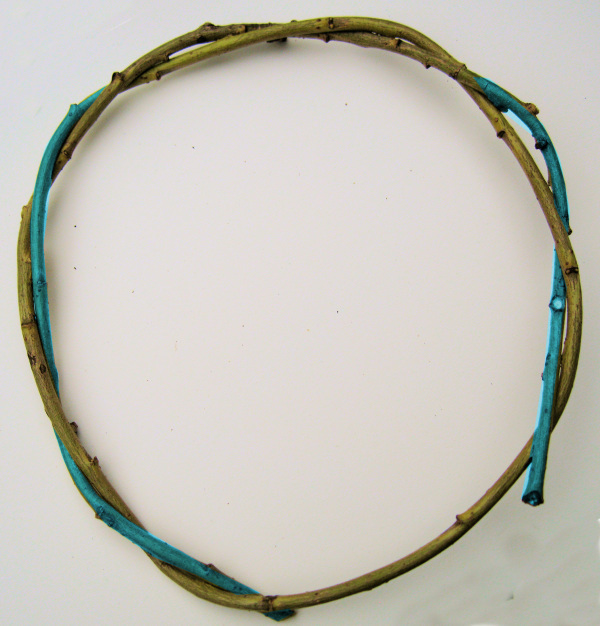 Your rabbit will be perfectly happy with the willow ring you’ve made, but if you think it looks a little untidy compared to the shop bought rings, all you need to do is snip off the sticky out bits. And that’s it – it seems a bit tricky at first but once you’ve got the hang of it you’ll need need to buy a willow ring again! Let me know how you get on if you give it ago. This entry was posted on Thursday, June 29th, 2017 at 11:00 am	and is filed under Toys & Enrichment. You can follow any responses to this entry through the RSS 2.0 feed. You can leave a response, or trackback from your own site.